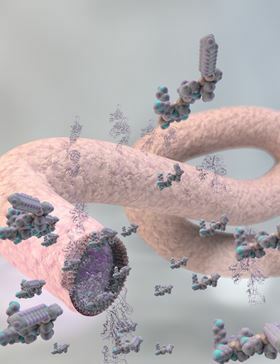 This new self-assembly method for proteins and peptides could be used to create artificial capillaries. Researchers at Queen Mary University of London (QMUL) have developed a way of assembling organic molecules into complex tubular tissue-like structures without the use of molds or techniques like 3D printing. The study, which appears in Nature Chemistry, describes how peptides and proteins can be used to create materials that exhibit dynamic behaviors found in biological tissues, like growth, morphogenesis and healing. The method uses solutions of peptide and protein molecules that, upon touching each other, self-assemble to form a dynamic tissue at the point at which they meet. This involves the peptides altering the shape of the proteins and guiding their assembly into complex shapes that can subsequently be used as scaffolds for tissue growth. This discovery could lead to the engineering of tissues like veins, arteries or even the blood-brain barrier, allowing scientists to study diseases such as Alzheimer’s in artificial tissue that has a high level of similarity to real tissue, which is currently impossible. The technique could also contribute to the creation of better implants, complex tissues and more effective drug screening methods. “What is most exciting about this discovery is the possibility for us to use peptides and proteins as building-blocks of materials with the capacity to controllably grow or change shape, solely by self-assembly,” said Alvaro Mata, director of the Institute of Bioengineering at QMUL and lead author of the paper. “The system is dynamic so it can be triggered on demand to enable self-assembly with a high degree of control, which allows the creation of complex shapes with a structure that resembles elements of native tissue,“ added Karla Inostroza-Brito, PhD student and first author of the paper. This story is adapted from material from Queen Mary University, with editorial changes made by Materials Today. The views expressed in this article do not necessarily represent those of Elsevier. Link to original source.